In this drama for children, a terrifying mythical beast is unleashed upon the human world. Wrenched away from the god Odin’s thunderous hunting party, Storm finds himself fallen from the clouds of the Otherworld and sharing pet store kennels with everyday Earth dogs. To make matters worse, he has lost his fearsome, horse-sized stature and has become a small, adorable puppy. Storm longs to return to The Hunt and to Odin’s glorious halls - he misses home and feels lost. His story is mirrored by that of Jessica - a twelve-year-old girl who has recently been forced to leave her mother behind in London and move to her father’s house in Abergavenny. When Jessica spots Storm at the pet store, it seems fate that they should be companions. There is fun to be had as Storm struggles to adjust to his new powerless existence. His booming demands become pathetic puppy whines, and he finds that he is not even a match for a common cat, and can’t understand why he feels so desperate to chase them up trees. Claire Fayers gives readers an hilarious glimpse into the lives of cats and dogs (and even sheep!) as they are given their own voice and internal monologues, and the diatribes of mighty Storm of Odin coming from a harmless puppy never stops being funny. Storm isn’t the only one grappling with his new existence. Jessica misses her mother and longs to make new friends, and can’t understand why her professors and classmates seem so strange (and so interested in her dog!). Almost every character in the story has hidden, magical depths and there is mystery and intrigue as Jessica tries to fathom who Storm and she can trust. Most of all, Storm Hound is about companionship. Jessica and Storm both learn that there is much more to ‘home’ than geography and familiar buildings, and that a powerful sense of belonging can be found when one learns to trust the right people. This heartening message is made loud and clear in an exciting, lightning-powered climax on a stormy Welsh mountain top. 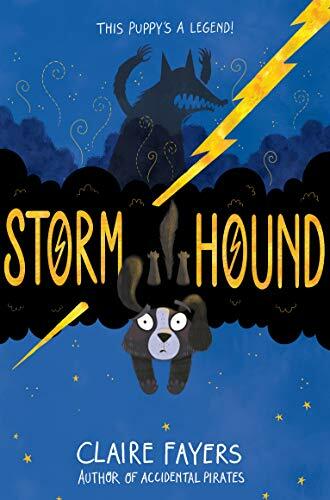 There is magic and laughter to enjoy in Storm Hound and a warm and fuzzy feeling to be had - not unlike cuddling a puppy!